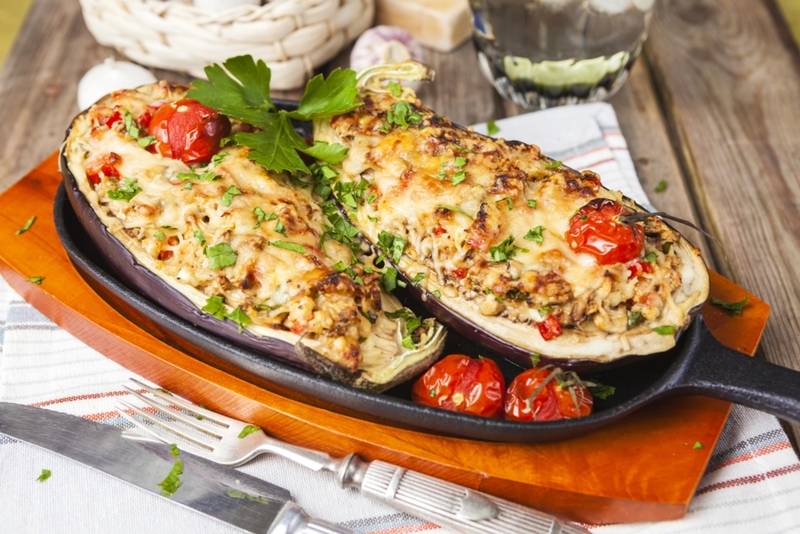 We definitely try to incorporate more healthy vegetarian meals into our diet when possible, but never want to sacrifice flavor, or be left feeling hungry, which is why we love eggplant! Eggplant has an earthy flavor that holds its own when paired with hearty tomato sauces, making it a favorite in Italian cuisine. With its dense texture, it’s also a great meat substitute in soups, pasta dishes and casseroles. It’s the star of the show in this recipe, which also features fresh cherry tomatoes and zucchini for a dish that is loaded with nutrients, and flavor! The yummy cheese topping and Italian seasonings are reminiscent of pizza, so kids will also love this dish. Just don’t mention that it’s good for you, and no one will be the wiser! Cut eggplants lengthwise. Scoop out the pulp of the eggplant, leaving enough of the outside of the eggplant to form a boat. Dice the eggplant and combine with zucchini, garlic, tomatoes and onion in a large bowl. Heat olive oil in a large skillet over medium heat. Saute vegetable mixture for 4-5 minutes. Add salt, pepper, basil and half the parsley to vegetables, and continue cooking for 1 more minute. Remove from heat, and stir in breadcrumbs and half of the mozzarella cheese. Lightly coat a baking sheet with nonstick cooking spray. Place the eggplant boats on the baking sheet. Fill eggplants with vegetable mixture, then top with remaining mozzarella and parmesan cheese. Bake for 25 minutes. Garnish with the remaining parsley and serve hot.